On Tuesday 26thMarch, Year 5&6 girls competed in a netball tournament at Hathershaw College. Overall, Roundthorn finished in 5thplace. The team did a brilliant job, with each member working well with their teammates, playing fairly, organising their team and trying their best. Well done team, you represented the school well and you should be very proud of yourselves! On Tuesday 19thMarch, Year 5 children competed in a tag rugby tournament at Hathershaw College. Overall Roundthorn finished in 4thplace. On Tuesday 5th March, Year 5&6 boys competed in a dodgeball tournament at Hathershaw College. Overall, Roundthorn finished in 4thplace. The team did a brilliant job, with each member working well with their teammates, playing fairly, organising their team, showing determination, trying their best and using impressive skills. Well done team, you represented the school well and you should be very proud of yourselves! They participated in a range of events and really enjoyed themselves. 4 children earned medals – 2 for being in the winning team and 2 for their individual efforts. 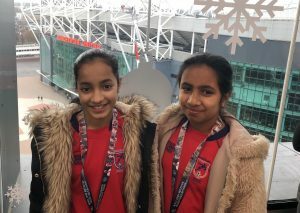 On Tuesday 11th December, our Year 5&6 football girls went to Hotel Football, next to Old Trafford Football ground to participate in the ‘Making moves from sidelines to centre circle’ female empowerment festival though the Manchester United foundation. We took part in a number of workshops focussing on sports psychology, social media, the history of women’s football, refereeing and we even took part in a FIFA 19 tournament. We had the most incredible day and met some inspirational women in the world of sport. We even spent time with Fred the Red! On Tuesday 15th January, Year 5&6 competed in a handball tournament at Hathershaw College. 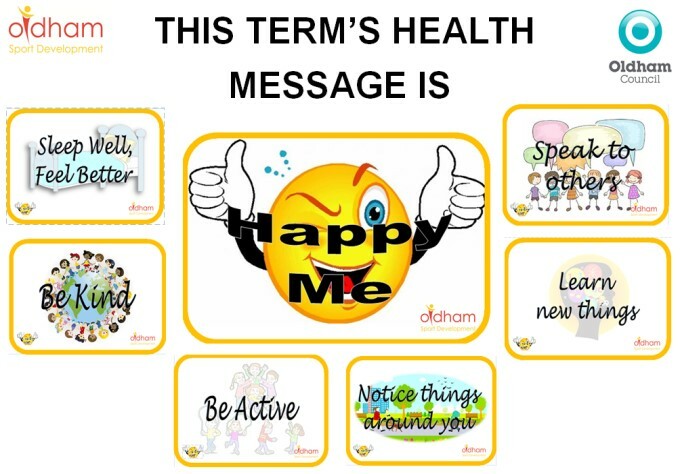 The team did a brilliant job, with each member communicated well with their teammates, playing fairly, organising their team and trying their best. Well done to Simba for his fantastic effort in goal! Overall, Roundthorn finished the event in 4th place. We had a fantastic time at this brand new event. Isaam and Huzaifah won medals for their amazing effort. 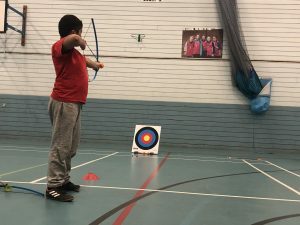 They participated in a range of events, including bowling, target practice, golf, netball, curling, beanbag throwing, penalty shootout, sack race, relay racing and “Kerby”. Haaziq was awarded a medal for their effort. Well done Haaziq! 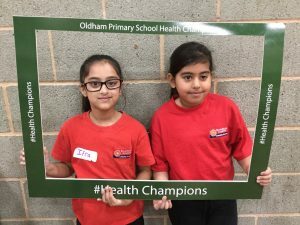 On Tuesday 13th November, a number of children from years 5&6 competed in a sportshall athletics event at Hathershaw College. Overall, Roundthorn finished in 2nd place, only 6 points behind 1st! The athletes worked fantastically as a team and encouraged each other to do their best. On Thursday 8th November, a number of children from years 1-6 competed in a cross country event at Alexandra Park. Year 1&2 Roundthorn finished 2nd place with Mohammed Ayaan in Year 2 winning the race. Year 5&6 boys Finished 2nd place with Simba from Year 6 finishing the race in 2nd place. Year 5&6 girls Finished in 2nd place. Overall, Roundthorn finished 3rd out of 16 schools. We are so proud of all of the runners who took part. They all put in a lot of effort into every race and worked so hard training and practising during the Daily Mile and in PE lessons prior to the event. On Tuesday 16th October and Tuesday 23rd October, Year 5&6 boys competed in a football tournament at Hathershaw College. 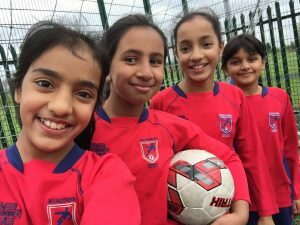 On Tuesday 2nd and Tuesday 9th October, Year 5&6 girls competed in a football tournament at Hathershaw College. Overall, Roundthorn finished 4th place out of 12 schools. The team did a brilliant job, with each member working well with their teammates, trying their best and showing fantastic sportsmanship, supporting our friends from Coppice. On Tuesday 18th September and Tuesday 25th September, Year 5&6 boys competed in a football tournament at Hathershaw College. Overall, Roundthorn finished at the top of their group. The team did a brilliant job, with each member working well with their teammates, playing fairly, organising their team, showing determination, trying their best and using impressive skills.